US BEV incentives cover the entire battery pack cost of the Chevy Bolt. As a result, the Bolt helped to increase the market share of affordable BEVs to 0.4%. Norway’s very large incentives brings the Bolt’s battery cost down to negative $220 per kWh. Affordable BEV market share remains around 15% with a slight recent uptrend. 2018 will be an interesting year as more BEV models are introduced and subsidies are reduced. 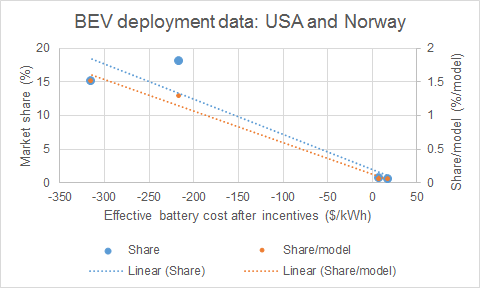 Last year about this time, I wrote an article looking for some insight into the future of battery electric vehicles (BEVs) based on current subsidized sales in the US and Norway. This article is a follow-up where I will add this year’s data points. After a few years of this practice, we should have a fairly decent idea about the level of subsidization required to achieve significant BEV market share. BEV sales in the US have increased steadily over the last year, although the market share of affordable BEVs remains below 0.5%. The steady sales increase in affordable BEVs is primarily due to the introduction of the Chevy Bolt, which opened a new market segment (affordable 200+ mile BEV). Bolt sales were sluggish initially, but have been increasing nicely in recent months. This increase may have something to do with the realization that most interested buyers will have to wait a long time for their Tesla model 3, which may cost them double the $25000 (after incentives) they were hoping for. The problematic Model 3 ramp also has not helped. With less than 400 units delivered over the past four months, Tesla looks likely to miss original 2017 guidance of about 40000 units by an order of magnitude. 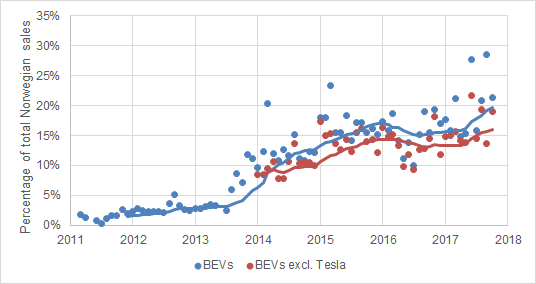 US BEV incentives have not changed much since last year’s article (which contains more details on calculations and assumptions). 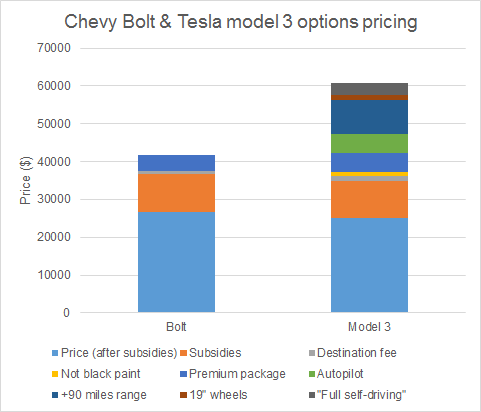 As shown below, total subsidies just about cancel out the total cost of a 60 kWh battery pack, implying that current Chevy Bolt buyers get their batteries for free. If you buy a BEV with a smaller battery pack, the effective price per kWh of battery capacity turns negative. Norway remains the undisputed champion of BEV market share. Although the BEV market share has been stagnant for almost 3 years now, sales seem to be increasing again. As in the US, this is also driven by new BEV models opening new market segments. 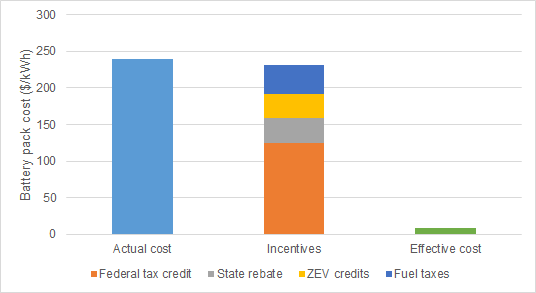 The effective incentive for Norway has decreased substantially in 2017, primarily due to a large reduction in the up-front tax on new cars (BEVs remain exempt of this tax). This tax is was primarily dependent on vehicle weight and power to discourage Norwegians from buying large gas-guzzling cars. High-performance BEVs have a much smaller efficiency trade-off than high-performance ICE cars, so the power component of this tax has been dropped completely. Indications are that the exemption from the 25% VAT is safe until 2020. This is especially important to luxury SUV buyers. For example, a Tesla P100X gets about $70000 in tax breaks from VAT and vehicle weight tax exemptions. Indications are that Norwegian policymakers are finally waking up to this “ludicrous” luxury subsidy and a “Tesla tax” could be implemented next year on electric cars weighing more than 2 tons. This tax may add up to $3000 to the price of a Model S and $12000 to the price of a Model X – a relatively small fraction of the existing tax break. The wide range of other BEV incentives in Norway may also see some gradual reductions in coming years. Some municipalities plan to start charging BEVs a small fraction of the tolls paid by regular cars and reduce areas where BEVs have free parking. 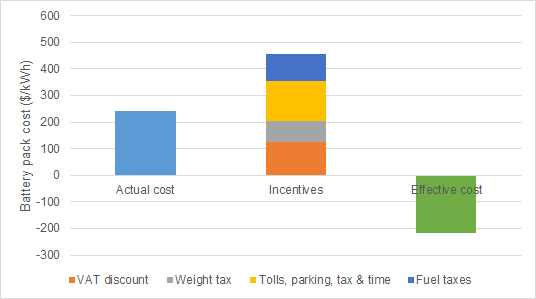 Due to these developments, I have reduced my estimated value of these benefits over a vehicle lifetime by 10% relative to last year’s number. Finally, Norway’s very large fuel taxes have increased further by 7%. Since BEVs pay no fuel taxes, this slightly increases the overall BEV incentive. 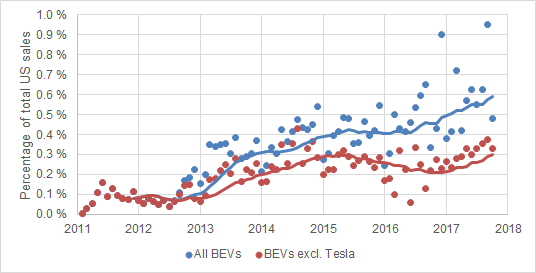 Even though several additional years of data will be required to draw meaningful conclusions, the four data points resulting from BEV sales performance in Norway and USA for 2016 and 2017 are plotted below. Battery pack cost is generally accepted to be the most important factor in BEV deployment, hence the selection of effective (subsidized) battery pack cost as the main independent variable. At this early stage of deployment, the number of available BEV models may also be a very important factor. We have seen that BEV sales increase substantially when new models open up new market segments. This has been clearly illustrated by the Model S, the Model X and the Bolt, which were the first entries in their respective market segments. For this reason, the data is also plotted per number of available models. However, BEV options will soon be available in all relevant market sections, after which the introduction of new models will have a steadily diminishing positive effect on sales. Several new BEV models will become available over coming years, giving insight into this dynamic. In the US, the $7500 federal tax credit will become a major talking point in 2018 as Tesla and GM close in on the 200000 unit mark. In fact, there is now a possibility that the tax credit will already be phased out by the end of this year. Expect plenty of fireworks as BEV proponents are forced to acknowledge the very large negative effect that a phase-out of the $7500 tax credit will have on US BEV sales. Personally, I think immediate tax credit phase-out would be a mistake. The subsidies should rather just be phased out according to the original plan. I really hope policymakers can avoid the destructive boom-bust cycles typical of subsidized growth (e.g. the US wind industry below).